Photo taken by Pippa Ranger/Department for International Development. November is World Prematurity Awareness Month and LPICO is spreading awareness to support the cause! Starting Friday Nov. 3, LPICO will post a global preemie fact on our Facebook page. “Like” our page and “Like & Share” our posts to enter into a random $100 Amazon Gift Card drawing. The more posts you share, the better your chances are to win. The winner will be selected and announced after the month ends. LPICO focuses on infants in low-income countries. Ninety-percent of extreme preemies in these deprived communities do not survive, opposed to 10% in high-income countries. Our job is to provide knowledge and resources to improve these preemies’ success rates. Help us spread the word by entering this contest. Also, consider donating to LPICO on Nov. 17 World Prematurity Day. Join our mailing list to stay updated. NO PURCHASE OR PAYMENT OF ANY KIND IS NECESSARY TO ENTER OR WIN THIS GIVEAWAY. A PURCHASE DOES NOT IMPROVE YOUR CHANCES TO WIN. Giveaway runs on https://www.facebook.com/Liyahpico/(“Facebook Page”) from 12:00 a.m. Pacific Time (“PT”) on 11/1/17 to 11:59 p.m. PT on 11/30/17 (“Promotion Period”). ELIGIBILITY: GIVEAWAY IS OPEN TO LPICO FACEBOOK FOLLOWERS. Employees of LPICO, Inc. (“Sponsor”) and their immediate family members (parent, child, sibling, and spouse), and persons living in the same households of each (whether related or not) are not eligible. To be eligible to receive the prize, you must meet all the eligibility requirements, and be a LPICO Facebook Follower at the time the prize is awarded. Void where prohibited by law. 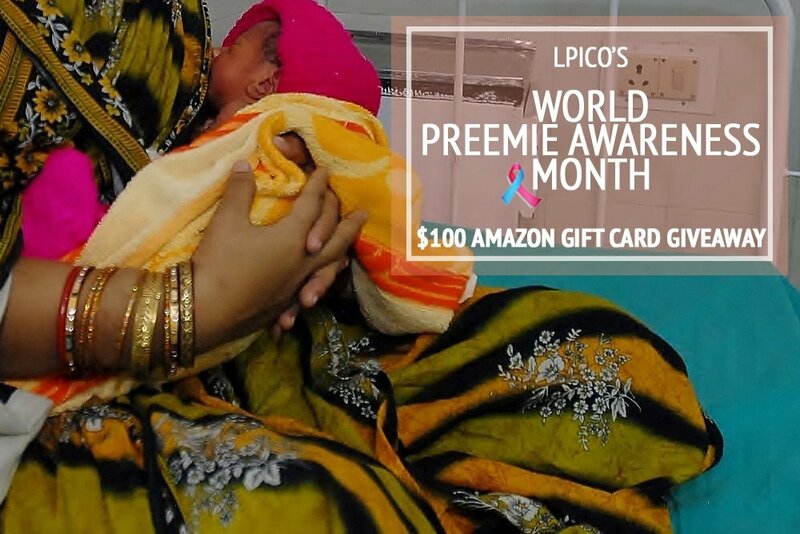 How to enter: You will automatically be entered in the giveaway when you “like” the LPICO Facebook Page and “like and share” any LPICO Preemie Fact during November’s Preemie Awareness Month. All “likes and shares” made after November will not be included in the giveaway drawing. To participate in the awareness, “like and share” LPICO’s Preemie Facts. The more facts you “like and share” the more entries you receive in the giveaway drawing. Prize: One (1) prize of $100 Amazon eGift Card will be awarded. Prize will be awarded to the customer whose Facebook profile is drawn. Any dispute as to correct person to receive the prize will be decided by LPICO at its sole discretion. Taxes or other assessments on all prizes are the sole responsibility of the winner. Undeliverable or unclaimed prize will not be awarded. Giveaway Drawing: A random drawing will be conducted by Sponsor on or about 12/15/17 from among all eligible names received during the Promotion Period. The odds of winning depend upon the total number of survey responses received. If Awareness Campaign does not yield at least 100 “shares” and 100 new page “likes” drawing will be canceled. Prize Award: The prize winner will be notified by Facebook post update within seven business days of the winner selection. In order to receive the prize, the potential winner will be required to complete a Declaration of Eligibility, Liability, and Publicity (where permitted by law) Release and a federal tax form. A potential winner who is not the age of majority in the State in which s/he resides will be required to have his or her parent or legal guardian complete the Declaration and tax form in order to be eligible to receive the prize. If the potential winner does not respond to the prize notification within 10 business days, if the potential winner is found to be ineligible or does not comply with these Official Rules, the Prize may be forfeited at the sole discretion of Sponsor and an alternate winner will be selected from among all remaining entrants. If the Declaration and tax form properly executed are not returned within 10 business days of the potential winner’s response to the prize notification, the prize will be forfeited and awarded to an alternate entrant. A potential winner who is disqualified for any reason will not be entitled to any form of compensation. Prize check will be awarded within 7 business days of receipt and verification of the Declaration and tax form. Winner will receive a 1099 tax form reflecting the amount s/he received as a prize. Prize may not be substituted or transferred. Privacy: Your participation in this Giveaway constitutes your consent for Sponsor to use your personal information only for the purpose of administering the Giveaway and awarding the prizes. General: All entries are subject to verification prior to awarding the prize. Federal, state, and local taxes and any expenses relating to the acceptance and use of a prize not specified are the responsibility of the winner. By entering, entrants release and hold harmless the Sponsor and their parents, subsidiaries, affiliates, directors, officers, employees, and agents from all and any injury, damage, loss, expense, accident, delay, inconvenience, or irregularity arising out of or relating to this Giveaway and the prize won, even if caused by the negligence of Sponsor. Sponsor is not responsible for printing or typographical errors in any Giveaway-related materials; for lost, stolen, late, misdirected, damaged, incomplete, illegible, or postage-due mail, or for transactions that are lost or fail to enter the processing system, are processed, reported, or transmitted late, or are lost for any reason including computer, telephone, paper, or any other malfunction including human error. Proof of submission does not constitute proof of receipt of entry. The date and time of entry receipt shall be determined by the official clock on the website. Submitted materials become the sole property of Sponsor and will not be acknowledged or returned. By entering, you accept and agree to these rules and the decisions of Sponsor which shall be final and binding in all respects relating to this Giveaway. Internet: If for any reason the Giveaway is not capable of running as planned, including infection by computer virus, bugs, tampering, unauthorized intervention, fraud, technical failures, or any other causes beyond the control of Sponsor or its affiliates that corrupt or affect the administration, security, fairness, integrity, or proper conduct of this Giveaway, Sponsor- at its sole discretion- reserves the right to cancel, terminate, modify, or suspend the Giveaway and to disqualify any individual who tampers with the entry process. If the Giveaway is cancelled for any reason before completion of the Promotion Period, all eligible “likes and shares” received up to the point of termination will be included in a random drawing to award the prize. Sponsor assumes no responsibility for any error, omission, interruption, deletion, defect, delay in operation or transmission, communications-line failure, theft, destruction, or unauthorized access to, or alteration of entries. Sponsor is not responsible for any problems or technical malfunction of any telephone network or lines, computer online systems, servers or providers, computer equipment or software, or for failure of any “likes and shares” to be received by Sponsor on account of technical problems or traffic congestion on the Internet or at any website or any combination thereof – including any injury or damage to participant’s or any other person’s computer related to or resulting from participation or downloading any materials in this Giveaway. ANY ATTEMPT TO DELIBERATELY DAMAGE THE WEBSITE OR UNDERMINE THE LEGITIMATE OPERATION OF THIS GIVEAWAY MAY BE IN VIOLATION OF CRIMINAL AND CIVIL LAWS. SHOULD SUCH AN ATTEMPT BE MADE, SPONSOR RESERVES THE RIGHT TO SEEK REMEDIES AND DAMAGES (INCLUDING ATTORNEYS’ FEES) TO THE FULLEST EXTENT OF THE LAW. Governing Law: The Giveaway and the Official Rules shall be governed according to the laws of Georgia, without regard to principles of conflicts of laws. All claims, actions, or suits must be brought in a court of competent jurisdiction in Monroe, Georgia. Force Majeure: The failure of Sponsor to comply with any provision of these Official Rules due to an act of God, hurricane, war, fire, riot, earthquake, terrorism, act of public enemies, actions of governmental authorities — outside of the control of the Sponsor (excepting compliance with applicable codes and regulations), — or other force majeure event will not be considered a breach of these Official Rules. © 2017 LPICO, Inc. All rights reserved.